I met Jim Ottaviani when he wrote for me at The Comics Journal. Not only is he a thoughtful writer, and a smart guy in general, but Jim is as cordial and friendly a person as I've ever known professionally. I was impressed to learn he moved into library work from being a nuclear engineer; I am even more impressed with his comics publishing projects of the last few years. In a lot of ways, Ottiavani's GT Labs is the perfect niche comics publisher. 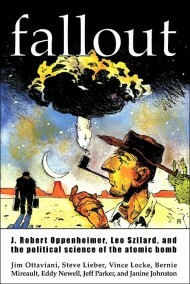 Ottaviani is putting out books that almost no one else seems to be doing, the work has all been of a high quality, and he works in an upfront, protect-his-contributors way that has allowed him to release work by a lot of cartoonists that might be beyond someone simply trolling for a movie deal. 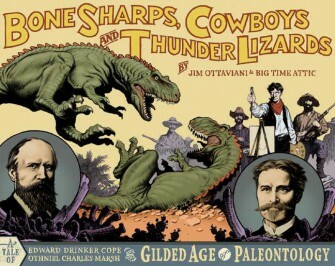 His latest work, this summer's Bone Sharps, Cowboys and Thunder Lizards, features work by the talented crew at Big Time Attic. While I always enjoy talking to Jim, I'm interviewing him this week in the hope that retailers and readers will ask after his new book duing its initial ordering period. Bone Sharps is listed in the June Previews catalog, on pages 285-286. 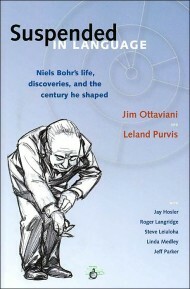 The order code is JUNE05 2984, and the vital stats are ISBN 0966010663 and $22.95. GT Labs is also publishing the previously unpublished autobiography of artist Charles R. Knight -- who appears as a character in Bone Sharps -- in conjunction with the graphic novel. The prose book contains a foreword by Ray Harryhausen and Ray Bradbury, an introduction by William Stout, and illustrations by Mark Schultz. There will be a softcover (096601068; June05 2985) and a limited hardcover (0966010671; JUNE05 2986). Jim and I were in contact the first week of June, 2005. TOM SPURGEON: Can you give me a sense of where GT Labs is right now as a business entity? Are you financially solid these days? From a business development standpoint, are you at the point you'd like to be, doing a book a year? JIM OTTAVIANI: Yes, I am where I'd like to be, and that's a good way to phrase the question, since I'm both the publisher and the author of the books and it's good to treat the two separately. By the way it's not quite a book a year -- closer to two books every three years. To answer the question you didn't ask first, though, as an author I'm at a pretty good point production-wise. Because the stories I do require a lot of research I'm producing about as fast as I can. Fortunately it's a good match with my publishing goals and capabilities. Back to finances: Because I have a day job that takes care of food, shelter, and the like, my first financial responsibility as a publisher is to the artists I work with. And the printer, of course, but they don't have the same relationship at the gut -- or if you prefer, sweat equity -- level, to any given book. I need to be able to pay these folks up front. Not before the artists produce the work, of course, but always upon receipt of the finished pages rather than upon publication. This isn't merely because I'm a swell guy; realistically I know that this is the only way it's possible to attract the kinds of people I've been able to work with so far. Because of the aforementioned day job as a librarian, and the very well-paying day job I had before that -- as a nuclear engineer -- I can make paying myself and the publishing company the second thing I do with money the books earn. Once I've taken care of that, the third priority is to pay royalties to the artists on the books that make money, since we share ownership of the work. SPURGEON: Do you enjoy the business side of comics? Some people can't stand it. OTTAVIANI: There are aspects I enjoy, and aspects I can't stand. I have orders to fill this week, and even though that means cashing checks somewhere down the line -- which I enjoy -- if I never packed another box and never scheduled a UPS pick-up again I'd be very happy. Not surprisingly, the things I enjoy are the things I think I'm good at, or at least getting good at. I like doing pre-press work. I like working with printers. I even like doing the bookkeeping and the end of the year financial report to myself -- it's kind of like doing a puzzle. The things I don't enjoy -- the things that come to mind immediately are marketing and promotion types of tasks -- are also the things I don't think I'm good at. Even one-on-one at conventions, which are exciting and fun on many levels, kill me. As any of my roommates at cons can attest, that stuff wipes me out, and I'm a wreck by the end of each day. I need to learn how to do that better. SPURGEON: Have you been able to get back on your feet in book distribution? What is it like as a small publisher trying to find bookshelf space with the explosion of manga, art comics and superhero trades? OTTAVIANI: Yes, to a large degree I'm back on my feet. To push the metaphor, I never really fell over completely since again, I never start a book without having the money in the bank to pay the artists and printer. LPC going bankrupt at almost exactly the same time as Fallout came out hurt a great deal. Here was the first book I did that really got some buzz in the world outside of comics -- some NPR air time, a review in Entertainment Weekly, etc., and I couldn't get the books to people. It was maddening and frustrating and generally unpleasant in too many ways to count. I can almost feel my blood pressure rising right now just thinking about it. It was a setback, especially on the royalty front. I finally got to pay out some additional money to the artists on Two-Fisted Science and Dignifying Science last year. Not huge checks, but I think -- I hope! -- a pleasant surprise for them nonetheless. I would have been able to do that three years ago, and likely at least one more time between now and then -- and on Fallout too -- if so much money hadn't evaporated into who-knows-whose hands. Anyway, I got back into the bookstore game by being one of the first publishers to sign up with Diamond Book Distributors. That was in June of 2002, after a few months of shopping around both by phone, mail, and in-person at BEA that year. It was perhaps a little risky, in that a) Diamond was untested in the book trade, and b) it felt like I was putting all my eggs in one basket. But in the end, the latter didn't seem like a significant worry: After all, if Diamond tanked the way LPC did the U.S. comics industry as a whole would have had a hard time getting their books onto any shelves, not just bookstores. As for the former, the contract Bill Schanes and Roger Fletcher offered me seemed fair, and unlike many other distributors Diamond was willing to negotiate on some points, and we arrived at something that works well for me, and apparently for them also. From the outset with the specialty market Diamond Comics has always treated me well, and that good relationship has carried over into their book distribution branch. I think one of the reasons for that actually allows for a segue into answering your second question. Paul Chadwick said something to me the other day along the lines of my books being "the thin edge of the wedge" into a place in bookstores and libraries that other comics or graphic novels can't get to. It was a very kind thing to say, and I think there's some truth to it as well, which may be one of the reasons Diamond -- and Cold Cut, and FMI -- have been so supportive. It's hard to get shelf space with all the other types of comics, much less books with fewer or no pictures at all. But the books I write and publish are different enough from the vast majority of manga, art comics, and superhero books that they find their way onto those crowded shelves. I'd love it if were easier, but non-fiction/historical fiction work is always a tougher sell than action/adventure. On the other hand, though, three out of the five Oscar nominees for best picture this past year were bio-pics, so maybe I'm nuts. On the other, other hand, they were about famous entertainment types, so maybe I should ditch the scientists. SPURGEON: Are there unique avenues open to you that other publisher might not naturally pursue? Has your book been purchased as a textbook? OTTAVIANI: I'm not aware of the books being used as textbooks per se. I'd say that only my most recent one, Suspended in Language, could really stand on its own in a physics course for non-specialists. But the books are used in classrooms -- NPR and CBS said so, so it must be true. Seriously, I found out about Dignifying Science being used on a trial basis in Maryland schools while washing the breakfast dishes one morning. That story got picked up on the CBS "Early Show" as well. I've heard from grade school and high school teachers as well about their using the books in classes, but these uses aren't built right into the curriculum as far as I know. SPURGEON: What about college bookstores? OTTAVIANI: I have anecdotal evidence that people buy them there, but no solid sales figures. I should check into that. I haven't marketed to them specifically. SPURGEON: Do you get reviewed in specialty magazines? OTTAVIANI: The books get reviewed in science magazines fairly frequently. Physics World, Discover, IEEE Spectrum, Physics Today, Physics World, and probably some others that I'm forgetting right now have all run reviews. And they're always positive, which is even better! SPURGEON: How much of your sales and promotion work is done one on one at conventions, and why do you think that works for a company your size? OTTAVIANI: Relatively speaking, not so much. I don't go to all that many conventions. San Diego and SPX have been the only two where I'm almost 100% certain to exhibit annually. I'll exhibit at a couple more each year, but I have to fit them in around the aforementioned day job. In other words, I probably spend as much time in the post office as I do at conventions. Getting promotional materials out to people and sending sample copies is the largest aspect of my advertising budget. While the old saying that the book speaks for itself isn't really true, it's close. There's no way a publisher like G.T. Labs -- which is the same thing as saying "a guy like me" -- can afford to be at all the conventions and buy all the ads that it would take to really get the media attention I've managed so far. But a book sitting on a reviewer's desk can get picked up by a feature writer or a senior editor who decides its worth an article. My job is to get the books onto as many of those desks as possible. So it's not really about conventions, but getting books in the hands of a lot of readers. That happens at conventions, but it happens in other ways as well. SPURGEON: I take it that the new book is about the pursuit of dinosaur fossils in the Old West, and perhaps even about the summer of '74. As explicitly as possible, can you describe what led you to that topic? It's not like the biographical work I think of when I think of GT Labs. OTTAVIANI: It's really easy to pinpoint this, actually. I used to do book buying for the university. While it sounds great -- buying books with somebody else's money -- I was a selector for mechanical, nuclear, and industrial engineering, which means I was deciding between titles like Really Hard Non-Linear Partial Differential Equations for Operations Engineers and Boring Topics in Dynamic Friction and Tribology III and stuff like that. But while going through a list of upcoming books, I ran across one I couldn't justify buying for the collections I was responsible for: The Gilded Dinosaur: The Fossil War Between E.D. Cope and O.C. Marsh and the Rise of American Science. Like many kids, I suppose, I went through a period where I could tell you ten differences between an Apatosaurus and a Camarasaurus. Combine that with the old west, and it sure sounded like something that would be fun to read about. So while I did the right thing by Michigan taxpayers and didn't buy it, I wrote down the title and started reading more about the so-called Bone Wars. SPURGEON: Is this all second hand book accounts, then? No -- I hope I didn't give that impression. That book was my introduction to the period and characters, but there was a lot more to read and learn. I tunneled back through the literature and read the canonical biographies of Cope and Marsh, both of which include many direct quotes, letters, etc. There's also a book by John Bell Hatcher, another fossil hunter who worked for Marsh that was really interesting and helpful. And then lots of things about the period, from government to circuses to telephony to Indian myths and legends. Eventually I even found myself digging through the unpublished autobiography of the artist Charles R. Knight for additional seasoning. This lead me to the idea of making the book more a piece of historical fiction than my previous ones. SPURGEON: Tell me about the decision to use some fictional work in this book, which is different in intent from your past works -- although correct me if I'm wrong. It's not like the truth is dull in this case. OTTAVIANI: Well, in all that reading I did find the truth a little dull, actually. Or maybe, to be more fair, I found the whole "war" aspect over-hyped. These guys never came to blows, or even did anything that went very far beyond questionable ethics. The wars were mostly fought in scientific journals and about who named more species and stuff like that. The two principles, Edward Drinker Cope and Othniel Charles Marsh --- the names almost sell the story! -- did feud, and that feud hit the popular press for a little while, but it wasn't something that had the country abuzz. That said, it's an interesting story about science, and more importantly, about greed and ambition. And the setting is marvelous. SPURGEON: What kind of liberties do you take? Details, coincidences, timeline...? OTTAVIANI: All of the above. As you can guess from what I said just now, the scientists themselves aren't likeable, and I wanted a likeable character for the book. So I introduce the artist Charles R. Knight into the story much earlier than he belongs in the real chronology. He provided me, and I hope the reader, someone to root for, identify with, and act as a foil for the narrative. 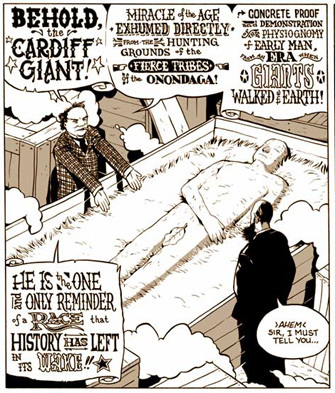 He's a real person, and the most influential dinosaur artist of the 19th and 20th century, but he doesn't really belong where I put him in chronology. It's not a complete stretch, as he worked with Cope, but a lot of what he does in the book didn't happen when we show it, or happen in the context we show it in. Most of it is based on fact as well, though, as I worked from that unpublished autobiography I mentioned earlier and unpublished memoirs of and conversations with his granddaughter to get details life. Or I should say previously unpublished autobiography, since I'm publishing an edited version of it in conjunction with Bone Sharps. In for a penny, in for a pound, then! With that decision made, and in the course of researching the period, I came across a number of story elements that would add to the narrative and provide some visual kick. In a book like this, after all, you don't want to merely see dinosaur bones. So having already played fast and loose with the appearance of one main character, I took the liberty to include some of these elements as well. SPURGEON: Is the fact that men like Marsh were larger than life figures and semi-bullshitters a part of that decision? Does the fact that much of the literature of the time was fanciful play a part? OTTAVIANI: Oh sure. I wouldn't say bullshitters, though: Cope and Marsh were the real thing and true experts in their field. So I'd pick a different word. Bullies? Blowhards? Still and all, roght, and I worked extra hard in this book to give many of the characters their own voice/mode of speech. Red Cloud, P.T. Barnum, and Marsh were particularly important to me along those lines. 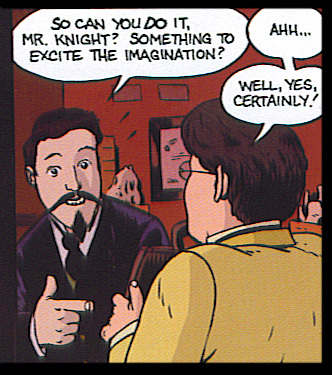 Barnum was fun, though Jeff Parker of Interman fame, when going over the script, caught a place where I missed an obvious and perfect line for Barnum. It's in there now...thanks Jeff! As you say, the literature of the time, and the types of headlines and writing you find in the newspaper accounts of the Cope and Marsh story are fun to read and to emulate. As an example, I'm fond of sub-titles in the first place, but doing this book gave me license to have not one, but three, each one longer and more overblown than the previous one. SPURGEON: I always enjoy hearing about Red Cloud. What role does he play here? Do you think that Red Cloud's assistance to Marsh was based solely on utilitarian means -- that Marsh promised to advocate on behalf of the Lakota -- or do you think that Red Cloud had any sympathy for the pursuit of bones for scientific purposes? OTTAVIANI: Red Cloud doesn't get a lot of panels devoted to him, but I think when you see the finished book you'll agree that he is an important character both in his own right and for the story as whole. He's the only one who can view the behavior of Cope and Marsh objectively and from an outsider perspective. Maybe not an objective view of their activities, but closer than anyone else. Regarding his relationship with Marsh, my reading of the history is that it was indeed utilitarian, as were the actions and motives of most of the Indians who were engaged in fossil hunting. Red Cloud's interest was mainly for the benefit of the Lakota as a whole. Other Indians stood to benefit personally as guides and laborers for the bone hunters. In that, they were much like most of the population out west: Far too busy scratching a living out of difficult country to get all worked up about the scientific expeditions that occasionally -- and only in fair weather -- crossed their paths. Scientific pursuits were luxuries that very few who lived on the land and over the bones in dispute could afford at the time. SPURGEON: How are the Big Time Attic guys splitting up the work? Has this meant anything different for you in terms of how you presented them with a script or story? OTTAVIANI: You know, I really don't know a whole lot more than what we put in the Free Comic Book Day sampler. For production matters, I interact the most with Shad. For the creative aspects -- storytelling, layouts, pencils, tones, lettering, etc.-- the division of labor there is, well, I can't tell you for sure how or whether there is a clear division of labor. I think the book is getting the benefit of three first-rate comics storytellers working on it. And me. And interns. Those Big Time Attic guys have interns! I hear you can order 'em on the inna-net, but I haven't found the site yet... if anybody has a URL for me, I'd appreciate it. I sure could use me some, and I promise it won't just be to pack boxes. So the answer to the first question tips you off to the answer to the second question: No, it didn't change how I presented the story at all. I had the script written, revised, thumbnailed -- I always thumbnail my stories to make sure they're drawable -- and revised into a final draft before hooking up with Big Time Attic. I was lucky to be in the right place at the right time to get them involved. SPURGEON: One of the things I get from your past works is insight into the intellectual mind as it becomes applied with a specific community, the support and also the problems with that. Is there anything you're trying to say here about such expeditions as science? I mean, is it a good thing that these bones were found and brought back east and into Europe? I think it was and is and always will be a good thing to find out about the way we got here, to learn our planet's history, and to puzzle out how such a successful group of critters like the dinosaurs lived and died both as individuals and species. People talk about obsolete groups and institutions as dinosaurs, after all, but we humans have been around for only a fraction of the time they dominated the planet, and our prospects don't look universally rosy...and that's without even worrying about a meteor impact to finish us off. Maybe through studying their history, coupled with a little reflection, we can learn something before we do ourselves in. That's the pessimistic side. The optimistic take on finding these bones and spreading them around among scientists is the same, only shorter: Maybe we can learn something! That's what people do, and should do. The capacity for science -- done individually and in groups or expeditions, as you put it -- is one of the things that makes us human, and has a great potential for changing our collective lot for the better. SPURGEON: Is there anything about the way these men operated that has any resonance for the way science works now? OTTAVIANI: Definitely. It would be much less interesting if their story didn't resonate with our times. You mentioned expeditions before, and these bone-collecting expeditions were among the first big scientific projects sponsored by the U.S. government. And that meant a hairball of big money and politics and the resulting bad behavior with good motivations and good behavior with less good motivations and all sorts of other stuff too. Interesting and often not-so-great things naturally follow from these tangles. That sounds whiny, so I'll add that in many respects and in many of the most exciting fields today the lone genius revolutionizing human thought and making startling discoveries is bound to be rare. There's no way an individual could bring us close-ups of Saturn's moons, or sequence a genome. Even in the citizen-scientist area, it's important to note that the X Prize winners had a bigger team and more funding than, say, Charles Darwin. I know that's not a good comparison -- spaceships to finches isn't even an "apples and oranges" thing -- but I hope you get my meaning. I have more affinity for the Richard Feynmans of the world than, say, NASA. But there are great stories to tell about both, waiting in the stacks of reference by my desk. Art: first three are books from GT-Labs; last two are from the interior of the latest book.